The WSOE returns with WSOE 2: The Hearthstone Showdown! Sixteen of the world’s top Hearthstone players duel for the title of WSOE Hearthstone champion! 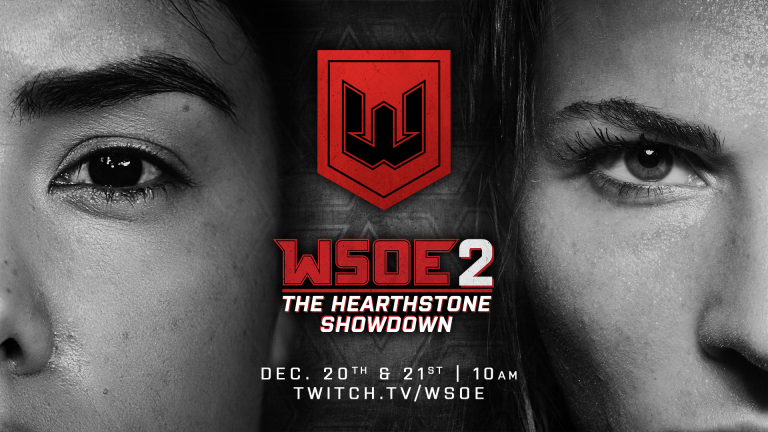 WSOE 2: The Hearthstone Showdown happens live on Twitch starting at 10a PT Thursday, December 20 and Friday, December 21. This double-elimination, bracket-style showdown tournament will feature over $30,000 in prizes, with the champion set to take home a $15,000 grand prize, the largest single prize ever claimed by an individual in WSOE history. In keeping with the WSOE’s commitment to innovative competition and presentation formats, The Hearthstone Showdown will showcase an all-woman lineup of players. Rumay “Hafu” Wang, Allie “Alliestrasza” Macpherson and “Pathra” Cadness join 13 other top women Hearthstone competitors. The winner will be invited to defend her title at a subsequent WSOE event in 2019. On the desk, The Hearthstone Showdown will feature Blizzard’s own TJ Sanders. TJ will be joined by a top crew of analysts and commentators, including Brian Kibler, Frodan, and Admirable. WSOE fan-favorite Lauren Jbarra returns as sideline reporter. A champion will be crowned! Watch on December 20.